on monday, while ryan was at a meeting, i decided to make cream of broccoli soup. broccoli is one of my favorite veggies, and i thought that warm soup would be perfect since it was cool outside. 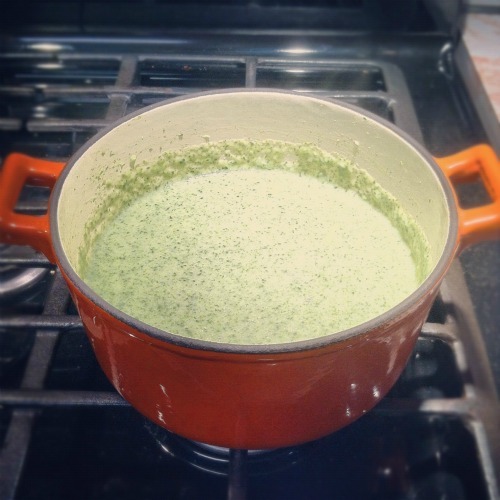 i have loved cream of broccoli soup ever since i was a little girl, and my recipe is an adaptation of my mom's cream of broccoli soup recipe. 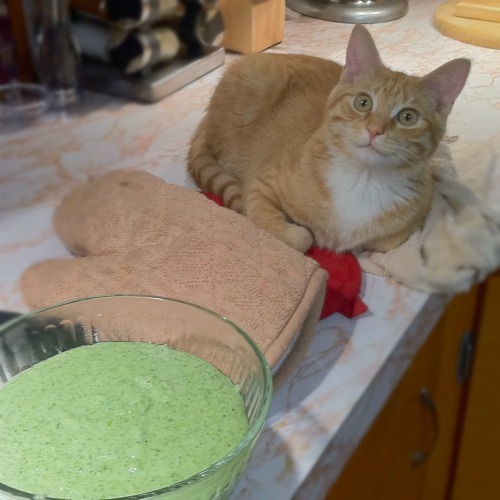 it turned out delicious, and i even had a furry little sous chef who sat on the kitchen counter and helped me make it! in a stock pot, bring broth to a boil. add broccoli and simmer for approximately 10 minutes, until broccoli is tender. in a separate pan, sauté onions in butter, until onions are tender. add onions to the broth and simmer. pour the soup into a blender, and puree until smooth. pour the soup back into the stock pot. add cream and stir. in a small bowl, whisk together flour and water. slowly add the flour mixture to the soup and stir until thick. season with pepper.